Working from the shed today I had to clear the whiteboard off a bit so I could hang some stuff up. A few months back I went to Service Design Futures event at UAL, which was excellent. In the corridor by the hall we were in was a wall highlighting the UAL design school manifesto, and as tear sheets. We believe in design as site of action and agency to radically transform our world. We believe in the power of design to critique, confront and challenge inequalities. We believe in questioning geopolitical, socio-cultural, and disciplinary boundaries. We believe that design operates in an ecology beyond the human centric. We believe that learning is continuous, collaborative and creative. We believe in the power of making as critical practice and tangible intervention. 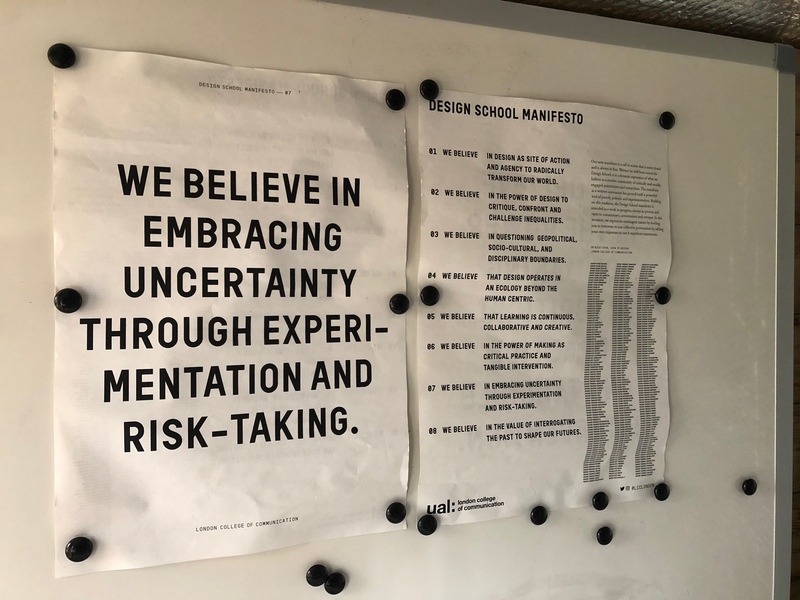 We believe in embracing uncertainty through experimentation and risk-taking. We believe in the value of interrogating the past to shape our futures. I grabbed me some of those sheets and had them stuck to the shed whiteboard since. I bloody love that seventh point. From the corridor of UAL to the corridor of uncertainty. Always in that corridor of uncertainty ain’t we.